Our Readings for this Sunday combine two major themes: awe and apostolate. Both Isaiah and Peter are awed and ashamed to find themselves in the presence of God; but both are subsequently sent out (in Greek, apostello) on mission for the Almighty. We, too, feel our unworthiness and need of mercy in God’s presence, and also our responsibility to spread the Good News of mercy to all people. This is the great call vision of Isaiah, chronologically the first revelation received by the prophet, but placed in the middle of the first section of his book (chapters 1-12) because of the centrality of its themes. The Church sees in this passage a kind of quintessential vocational call, and employs excerpts of it as an option for the Common of Pastors, and in masses for vocations to the priesthood or religious life. There is no superlative formation in the Hebrew language, so the superlative concept is expressed in various other ways, one of which is repetition. The triple repetition of “Holy” is a way of expressing, “Most Holy.” This song of angelic worship is still employed in mass, of course, in the Sanctus. This expresses the faith that our liturgical celebration of mass is spiritually united with the ongoing worship of the angels and saints in heaven. In the burning coal taken from the altar of God, which cleanses Isaiah’s lips of sins, we can see a type and image of the Eucharist, which is also taken from the altar of God, and purifies us of venial sin when it is placed on our lips. The Eucharist is “burning” with the fire of God’s love—it is, so to speak, a piece of tissue from the Sacred Heart of Jesus, enflamed with love for the world. The effect of receiving the Eucharist at mass should be to enflame our hearts with love for God and one another, and make us eager to fulfill the mission of the Church: “Here am I! Send me!” The mass ends, in Latin, with the abrupt phrase, “Ite! Missa est!” which could be translated colloquially as “Get out of here! The sacrifice is over!” We usually soften the expression in English: “Go in the peace of Christ” or some similar formulation. Yet the blunt Latin phrase telling us to leave the Church is a reminder that, when mass is over, we ought to get right back to fulfilling our mission from God, which is to spread his Good News through our words and actions. “What comes out of the mouth, this defiles a man … [for] what comes out of the mouth proceeds from the heart … evil thoughts, murder, adultery, fornication, theft, false witness, slander. These are what defile a man; but to eat with unwashed hands does not defile a man” [see Matt 15:10-20]. In a particular way, we need the power of God to cleanse our mouths, and our hearts, also. Following the divinely inspired teaching of our holy Fathers and the tradition of the Catholic Church (for we know that this tradition comes from the Holy Spirit who dwells in her) we rightly define with full certainty and correctness that, like the figure of the precious and life-giving cross, venerable and holy images of our Lord and God and Savior, Jesus Christ, our inviolate Lady, the holy Mother of God, and the venerated angels, all the saints and the just, whether painted or made of mosaic or another suitable material, are to be exhibited in the holy churches of God, on sacred vessels and vestments, walls and panels, in houses and on streets. (Council of Nicaea II: Denziger-Schönmetzer 600). Our Second Reading is simply marching through 1 Corinthians; it was not selected to fit our Gospel and First Reading. Yet, as is so often the case, we find providential themes and connections. This Second Reading fits with the Gospel in that (1) both point to the primacy of Peter in the structure of the Church and (2) both show the sense of unworthiness that the two greatest apostles felt in the presence of the holiness of Christ. The resurrection of Christ is not simply some “theological” truth or an allegory with a moral message. It is a fact of history, attested by numerous witnesses. This is one of the major points of Brant Pitre’s recent book, The Case for Christ. The first of the witnesses that St. Paul mentions is “Cephas.” “Cephas” is the Aramaic name for St. Peter, since kepha is the Aramaic word for “rock.” Kepha is an indeclinable noun (i.e. it does not take gender endings), but when it is transliterated into Greek and used as a man’s name, an “s” is added at the end as a marker of the masculine gender, creating the name “Kephas.” The Greek word for “rock” is petra, which needs to be converted to the masculine gendered form petros to be employed as a man’s name. By referring to Simon Peter as “Kephas” and listing him as the first witness to the resurrection, St. Paul acknowledges the primacy of this apostle and the importance of his role as a foundational member of the new community. The name “Kephas,” “Rock,” calls to mind the account of Matthew 16:13-20, which describes how Simon acquired this name from Jesus himself when he was appointed the “Rock” on which the ekklesia (congregation, “church”) would be built. The spoken language of the events of Matthew 16:13-20 was almost certainly Aramaic, but the dialogue between Jesus and Peter is translated into Greek in Matthew’s Gospel. St. Paul lists Peter as the first witness of Jesus’ resurrection and himself as the last, so together these two apostles are the “alpha and omega” of first-hand witnesses. St. Paul calls himself “the least of the apostles” and “not fit to be called an apostle.” His humility in the presence of Christ reminds us of Peter’s in the Gospel Reading. Peter is reluctant to obey Jesus’ command. Who is this rabbi from Nazareth who thinks he knows about fishing? First of all, the prime time for fishing was at night, and Simon and his co-workers had already labored all night and there were no fish to be had. If there were no fish at night, there certainly won’t be any in broad daylight, in the afternoon. Secondly, the better places for fishing were close to the shore, where there were plenty of plants for the fish to feed on, not out in the relatively empty deep water. The rabbi from Nazareth wants them to go on a fool’s mission, getting their just-cleaned nets dirty again in a vain effort. Nonetheless, Simon defers to Jesus’ wishes. Is it the force of Jesus’ personality? A “sixth sense” that this is no ordinary rabbi? Deference for the public prestige that Jesus has gained? An unwillingness to publically oppose a clergyman renowned for his healings and teachings? When he sees the catch of fish, Simon realizes he is in the presence of no ordinary teacher. This man has control over the forces of nature: he seems to have compelled to the fish to swarm in a place in the lake and at a time that was contrary to their natural habits. No one can wield such power unless he has received it from God. In the face of God’s presence in the person of this rabbi Jesus, Peter is overcome with a sense of his own smallness, and perhaps also with shame for having doubted Jesus’ wisdom and abilities just a few moments before. The parallelism with the First Reading is obvious. Both Isaiah and Peter are struck by their “uncleanness” or sinfulness when the realize that they are in the presence of the Almighty. Peter recognizes that Jesus is no mere man. One doesn’t prostrate oneself in front of a good teacher and plead with him to depart, because of one’s sinfulness. Peter is experiencing what the sociologist of religion Rudolf Otto described as “numinous awe”, a radical sense of one’s unworthiness in the presence of the Transcendent. The word translated as “astonishment” in our reading could also be translated “fear”: “For fear seized him, and all who were with him, because of the catch of fish.” Again, one doesn’t respond in fear to a simple traveling preacher, no matter how good his preaching. Luke is gradually moving us toward realizing that Jesus is God. In the original formulation of this prophecy, Jeremiah’s “fishers” appear hostile. Yet Jesus introduces a new element to the fulfillment of this prophecy—in God’s mysterious will, the “fishers” that he sends are not seeking to exterminate the “fish” (the remnant of Israel), but now to gather them back together. The ministry of the apostles is, first of all, to the “lost sheep of the House of Israel” (Matt 10:6). Matt. 13:47 “Again, the kingdom of heaven is like a net which was thrown into the sea and gathered fish of every kind; 48 when it was full, men drew it ashore and sat down and sorted the good into vessels but threw away the bad. 49 So it will be at the close of the age. The angels will come out and separate the evil from the righteous, 50 and throw them into the furnace of fire; there men will weep and gnash their teeth. The kingdom of heaven is not simply a future reality, the “heaven” that we speak of in the next life. As this parable makes clear, the kingdom of heaven exists in this age and in this life. In fact, it is the Church, which is the “net” wielded by the hands of the apostles (and by their successors). 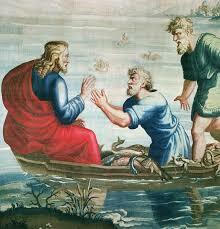 Many fish of different kinds, good and bad, are caught in the “net” of the Church. In recent years, the news has been filled with stories about “bad fish.” Although this is greatly distressing, Jesus warned us in advance that the “bad fish” would be present in the kingdom during this age. It is not till the end of the age, at the second coming of Christ, that the “net” is pulled out and God’s Church finally purified. Jesus will repeat this miracle once more near the end of his time on earth with them (see John 21). Thus Jesus begins and ends his education of the apostles with miracles of miraculous catches of fish. These two bookends on the apostolic training point to the centrality of evangelism to the role of the apostles. From beginning to end, they are to be fishers of men. The Church has been vocal and unabashed about stressing the evangelistic responsibility of bishops, the successors of the apostles. The message of this Gospel for us today can be summed up in the Latin phrase so beloved by John Paul II: “Duc in altum!”, “Put out into the deep!” This is Jesus command to Peter and it remains his will for the whole Church. Yes, we are facing a hostile culture. Yes, there are “bad fish” out there. Yes, we have been laboring for years “in the night” and don’t seem to have gotten anywhere. None of that can prevent the Lord from delivering an abundant catch. But if we fail to rise to his challenge, and disobey the command to sail out to deep water, it won’t happen. Recent pontiffs have been emphatically calling on Catholics to take risks in order to go into the “deep water” and spread the Gospel. Let’s heed their call and go fishing.